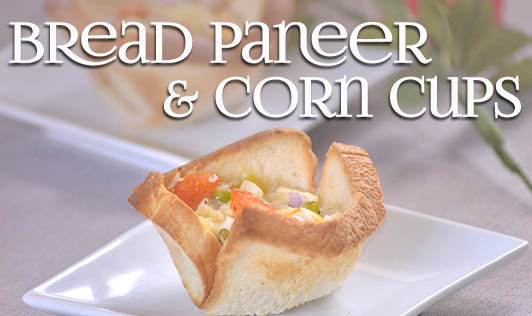 Bread paneer and corn cups are an easy-to-make, nutritious recipe. It takes almost no time to make and works as the perfect choice when you have unexpected guests. 1. Mix crumbled paneer, green chili, bell peppers, and sweet corn together in a bowl. 2. Season the paneer with ½ tsp Italian herbs, salt, and pepper, and set aside. 3. Slice off the edges of the bread and cut it into circles using a round cookie cutter or a wati. Flatten the circles slightly, using a rolling pin. Make sure you don't flatten it too much. 4. Apply a little butter on both sides of the bread circles and gently fit them into muffin moulds. You don't need to grease the muffin moulds. 5. Spread the pizza sauce on the slices and fill it with the paneer filling. 6. Preheat the oven to 180°C and bake the cups for 15 to 20 minutes until the cups turn slightly golden brown at the corners. Make sure the cups are crispy enough to hold the filling. 7. Garnish with tomato ketchup and serve hot immediately. • If you are using whole-wheat or brown bread, check carefully after 10 minutes as browning doesn't show up quickly on brown bread. • If you are using milk bread, do not flatten the circles. Doing so will crumble the bread, so flatten it slightly just to fit it in the muffin pan without using the rolling pin.